Hey everyone! 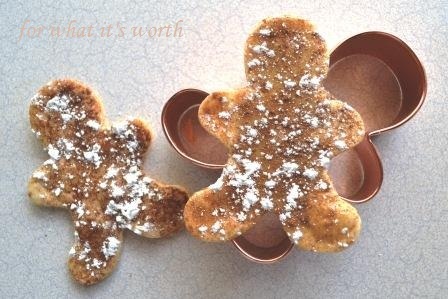 Today, Jeannie from For What It's Worth is sharing a yummy recipe with you all. Be sure to pop over and visit her AND wish her a very HAPPY BIRTHDAY since today is her birthday! On to the deliciousness! Here in Texas, Mexican cuisine is a weekly affair. After dinner...or even sometimes while waiting for dinner...you can make a light cinnamon crisp. They are not too sweet, a lot like a thin flavored cracker. 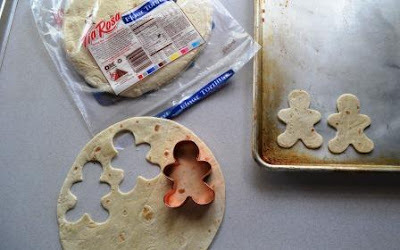 For the holidays I pull out a Gingerman cookie cutter to cut festive shapes out of purchased flour tortillas. I chose the gingerman because the color is just perfect. 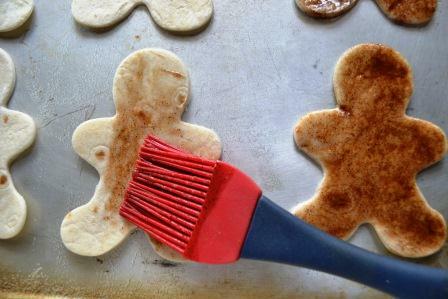 Use a pastry brush or even the back of a spoon to spread a little honey on top of the shapes. Sprinkle a little cinnamon on top of the honey. Place the tortilla gingermen on a cookie sheet and bake for 10 minutes at 350 F. Let them cool and dust a little powdered sugar "snow" on them. Leave a little container of honey out for dipping. They go quickly with little grands around. I just love the holidays, everything seems special. Just wanted to stop and say "Hello". 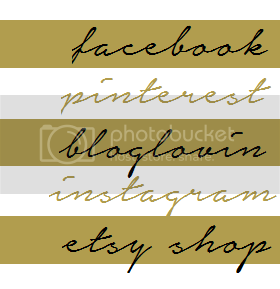 Found you through the creative bloggers Facebook page. I am a fellow "Ohioan" blogger. My 3 oldest boys are schooling and living in Cincinatti. I am a new follower!